Takotsubo cardiomyopathy (broken heart syndrome) is a rather peculiar and certainly acute condition. Much research has been devoted to it in recent years. Most cases (70%) of takotsubo cardiomyopathy occur in situations with extreme stress, such as car accidents, gun violence, threats, or any situation in which the individual’s life is (or perceived as it is) in danger. Takotsubo cardiomyopathy is much more common in women (70% are women) and elderly individuals. The typical patient presents with severe chest pain, dyspnea and occasionally hemodynamic compromise. The ECG shows localized ST segment elevations, T-wave inversions and occasionally pathological Q-waves. Troponin levels are often mildly elevated. Hence, takotsubo cardiomyopathy cannot be differentiated from ST segment elevation myocardial infarction. Due to their clinical presentation, these patients are immediately referred to angiography but no coronary artery occlusion can be identified. Injection of contrast media into the ventricle will instead reveal that the apical portion of the left ventricle is dilated (hence the term apical ballooning syndrome). This syndrome was first descried in 1991 in Japan and the authors termed it takotsubo, which is the Japanese word for a kind of octopus trap (the left ventricle takes the shape of that octopus trap). Refer to Figure 1 and Figure 2. Figure 1. Echocardiogram showing takotsubo cardiomyopathy in acute phase (A) and resolution phase (B). 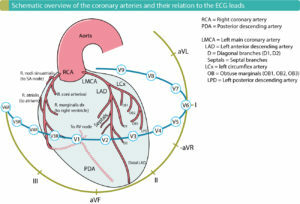 Note the apical ballooning of the apical portion fo the left ventricle (A). Source. Figure 2. Left ventriculography during systole showing apical ballooning akinesis with basal hyperkinesis in a characteristic takotsubo ventricle. Studies from the US and Japan has estimated that up to 2% of patients referred to PCI with a suspicion of STE-ACS/STEMI, actually have takotsubo. Previous studies reported that 98 out of 100 cases had full recovery. More recent studies has reported mortality rates reaching 4%. 80% of patients have localized ST segment elevations (mostly in the chest leads). The morphology of the ST segment elevations cannot be differentiated from those seen in STEMI/STE-ACS. 64 % have T-wave changes (mostly inversions) accompanying the ST segment elevations. Although several criteria has been suggested, the ECG cannot distinguish takotsubo cardiomyopathy from STE-ACS/STEMI (Johnsson et al Int J Cardiol, 2011). Therefore, these patients must be managed as STE-ACS/STEMI until angiography has been performed. Note that troponins may be elevated but the elevation is typically discrete and not on a par with the degree of left ventricular impairment. This topic is still under investigation. A number of plausible mechanisms have been suggested. Among them are coronary artery vasospasm, dysfunctional capillary function and catecholamine toxicity. The latter theory is corroborated by the finding that 75% of patients have increased plasma levels of catecholamines. Lyon et al: Current state of knowledge on Takotsubo syndrome: a Position Statement from the Taskforce on Takotsubo Syndrome of the Heart Failure Association of the European Society of Cardiology.